Welcome to the DFAB HOUSE website: Stay tuned for future construction news! 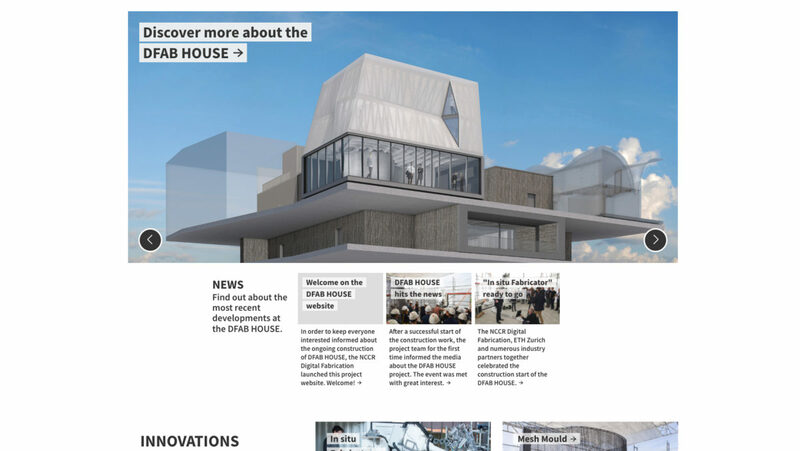 The National Centre of Competence in Research (NCCR) Digital Fabrication welcomes you on the brand-new DFAB HOUSE project website. The project website will keep you informed about all relevant construction news around the unique architecture project DFAB HOUSE. The new DFAB HOUSE project website informs you in detail about DFAB HOUSE’s design concept, its building site NEST, and all the architecture and construction innovations which are for the first time being transferred from the laboratory to a real construction project: the “In situ Fabricator”, “Mesh Mould”, “Smart Slab”, “Smart Dynamic Casting”, and “Spatial Timber Assemblies”. In addition, you can learn more about how “Smart Home technology” will also breathe digital life into DFAB HOUSE once the three-storey housing unit will be finished and operational. And of course you can also discover which industry partners support the realisation of DFAB HOUSE. However, most importantly in the news section you can keep yourself up-to-date about the construction progress. If you feel there is any information missing, we are happy to receive your feedback. We hope you will enjoy the new site and come back often! DFAB HOUSE is officially open!